The huge variety of specialised and generic computers in the hospital gave me something to think about other than myself (which was very, very welcome under the circumstances). Namely, how much all this was costing; and how you could use Raspberry Pis to take some of that cost out. Here’s a study from 2009 about some of the devices used on a ward. That’s a heck of a lot of machines. We know from long experience at Raspberry Pi that specialised embedded hardware is often very, very expensive; manufacturers can put a premium on devices used in specialised environments, and increasingly, people using those devices are swapping them out for something based on Raspberry Pi (about a third of our sales go into embedded compute in industry, for factory automation and similar purposes). And we know that the NHS is financially pressed. This is a long-winded way of saying that we’re really, really pleased to see a Raspberry Pi being trialled in the NHS. This is the MediPi. It’s a device for heart patients to use at home to measure health statistics, which means they don’t need daily visits from a medical professional. Telehealth devices like this are usually built on iPads using 3G and Bluetooth with specially commissioned custom software and custom peripherals, which is a really expensive way to do a few simple things. MediPi is being trialled this year with heart failure patients in an NHS trust in the south of England. Richard Robinson, the developer, is a a technical integration specialist at the Health and Social Care Information Centre (HSCIC) who has a particular interest in Raspberry Pi. He was shocked to find studies suggesting that devices like this were costing the NHS at least £2,000 a year per patient, making telehealth devices just too expensive for many NHS trusts to be able to use in any numbers. MediPi is much cheaper. The whole kit – that is, the Pi the touchscreen, a blood pressure cuff, a finger oximeter and some diagnostic scales – comes in at £250 (the hope is that building devices like this in bulk will bring prices even lower). And it’s all built on open-source software. MediPi issues on-screen instructions showing patients how to take and record their measurements. When they hit the “transmit” button MediPi compresses and encrypts the data, and sends it to their clinician. Doctors have asked to be able to send messages to patients using the device, and patients can reply to them. MediPi also includes a heart questionnaire which patients respond to daily using the touch screen. We created a secure platform which can message using Spine messaging and also message using any securely enabled network. We have designed it to be patient-friendly, so it has a simple touch-tiled dashboard interface and various help screens, and it’s low cost. Clinicians don’t want to be overwhelmed with enormous amounts of data so we have developed a concentrator that will take the data and allow clinicians certain views, such as alerts for ‘out of threshold’ values. My aim for this is that we demonstrate that telehealth is affordable at scale. We’re really excited about this trial, and we’ll be keeping an eye on how things pan out. We’d love to see more of this sort of cost-reducing innovation in the heath sector; the Raspberry Pi is stable enough and cheap enough to provide it. This kind of project is amazing. Rapsberry Pi has the power to change lives and institutions! You are all doing a great thing making computers so cheap and reliable. I am sure this is only the first NHS project of many to come. This is wonderful. My father died from heart-related issues a number of years ago and always hated constant check-ups with doctors and nurses. He would have loved this. This is where I want to see this being used. To actually help people. This is a very nice solution. Telehealth, who ever is supplying the solution, always saves money and the patients prefer the system. I worked on a solution few years ago that shipped to a number of health authorities. That used 2G and android tablets or mobiles. Similar price range. (a little cheaper). I don’t work at the company now but wanted to share for balance. I’d love to know how much the NHS spends on Microsoft licenses each year. You missed a treat not seeing the OR. Three of the last five operations in the past 7 years I was wheeled in conscious and it was amazing. The first one was 7 years ago and they had an array of monitors on arms that automatically avoided sitting behind peoples heads and allowed the staff to see at a glance how things were going. The second they had two 60″ 4K LCD screens side by side giving a full size 3D real time ultrasound of my vascular system head to toe and giving readouts in real-time. They got me in there early so they gave me a verbal tour of the system. The third was much like the first since it was a general purpose OR. ANd I should have said earlier Liz, I am very happy that you are well again! This blog post is a gem (and it’s one of the reasons I visit your website daily). I’ve been pleasantly surprised, amused and awed by some of the ingenious applications of Raspberry Pi. 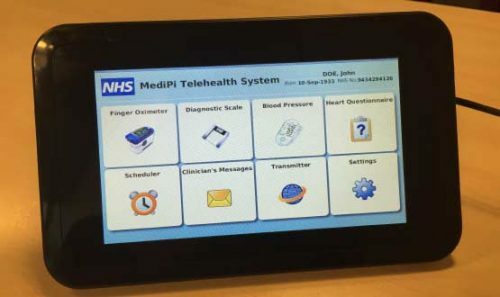 So this is the first NHS tested Pi powered tricorder…? But does it have cat pictures? And we developed one such device here in India! We will be going into trials soon enough. Lets hope to reduce the cost of medical care and therefore the insurance costs too! My mom has been sick for years and I put a raspberry Pi + monitor near her bed and asked the domestic helper to take her blood pressure, temperatures and record them into the MYSQL database application (that I wrote) running on the Pi, so that I can remotely read and analyzed (plot charts). I so use to to print charts to show to the doctor. A device like this can help the helper to directly input the data and avoid human errors. Forgive me, but as an electical engineer I would be alarmed by the suggestion that my healthcare might depend on a device that doesn’t have a specification or any performance guarantees. This should not be the way of the future. Yes it’s cute, yes it’s cheap, yes it’s British – just like a singing postcard from the Tower of London – and about as worthy of the task. In whose estimation and under what conditions? The evidence is already there. Raspberry Pi is no toy device – it’s tried and tested in many environments including vital industrial control. The Linux OS is solid and robust with an unparalleled provenance in critical systems. It is *at least* as stable as Windows, IOS etc and is used in many medical systems. The USB devices are CE marked and are COTS products which, provided the patient knows how to use them properly, provide proper indicative readings. At the end of the day it’s about risk and benefit – as Liz says, the device isn’t administering medicine, giving advice or interpreting the results, it’s simply a secure conduit for data taken by the devices to be transferred to clinical systems which can then “use” it. 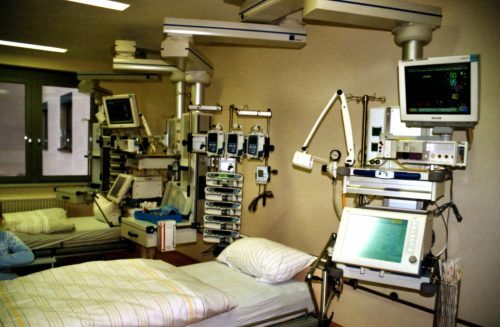 And yet the opening photo of the blog entry shows a room full of safety-critical medical care equipment – worth many, many thousands of pounds, and which has had to pass stringent tests for Standards compliance – and by association, puts the Pi at the same level. It’s nothing short of fraudulent. I have no problem with the Pi for educational and hobby uses. That’s where it belongs, in applications where the consequences of failure are minimal or nil. Now, to make them go “ping”! where does one get the code? Such an excellent idea and definitely the way forward. It’s really great to see this sort of project gaining momentum as I get the impression that healthcare is a difficult field to break and change; we are behind with our use of technology and very much stuck in our ways but this is slowly changing!